The new Height Rider 15N (HR15N) will lift 2 men and their tools to a working height of 15.5m or a working outreach of 9.7m. A 180° rotating cage and fly-boom coupled with fully proportional multi-function controls deliver exceptional precision when positioning, making tasks easier and quicker to complete. The HR15N's compact dimensions and zero-tail-swing enable it to travel through and work in restricted spaces, while its non-marking tyres mean it can work both inside and out, making it ideal for maintenance or industrial work. The HR15N is available with two power options. 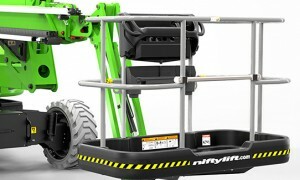 You can choose from super-efficient battery power, or Niftylift's revolutionary Hybrid power system. The battery ('Electric') power option is ideal for indoor use, or for quiet, clean operation. It comes with an all-electric drive that allows its maintenance-free AGM batteries to work for longer on a single change, so more work can be completed and running costs reduced. 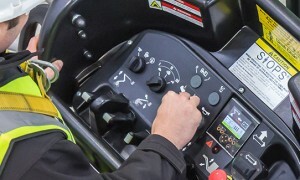 The Hybrid power option incorporates a smaller, power-optimised Tier IV compliant engine, supported by the machine's battery pack when extra power is needed. 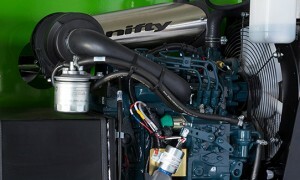 This maintains power and performance while reducing fuel consumption for maximum efficiency. The Innovative 'Diesel Re-Gen' feature also recharges the batteries without a mains power source, giving a 'fast-charge' whenever the machine is idle and the engine running. In addition, the Hybrid system also offers an electric-only mode, perfect for indoor, or quiet and clean operation. 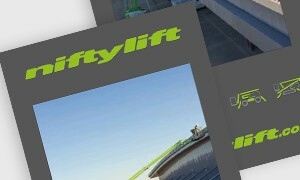 The HR15N also incorporates Niftylift's ToughCage, and multi-award winning SiOPS® safety system, which eliminates sustained involuntary operation by instantly halting machine movement if the operator is pushed against the control console. For more information regarding the HR15N or any other self-propelled boom lift, such as the HR12N or HR17N, please contact us.